From the time it was first lit in 1870 until it was decommissioned in 1933, Mission Point Lighthouse had a 5th Order Fresnel Lens. The light from this lens can be seen for 13 miles. (There are six sizes, or “orders” of lenses for lighthouses; a 1st is the largest, 6th is the smallest. Whitefish Point, which many people have visited, has a 2nd Order on display.) Sadly, when the Coast Guard closed Mission Point Lighthouse, the lens disappeared. Rumor is that it was stolen by teens and then broken. Mission Point’s lens, like many smaller lenses, lacked any kind of identifying marks, so if it were removed, there is no way to know where it is today. However, many of the Great Lakes lenses were saved, and on May 19, 2011, Mission Point Lighthouse acquired a 5th Order Fresnel Lens on loan from the Coast Guard. It now sits beautifully in a display on the second floor for all to appreciate. May 19, 2011 - “Lampist” Kurt and a helper carefully carry the lens into the Lighthouse. There are only a few Lampists in the country, and are the only people allowed by the Coast Guard to handle, clean, repair, and restore Fresnel Lenses. The Fresnel Lens was slowly unpacked. This lens originally lit the waters near Milwaukee, but had been under Coast Guard care at Sleeping Bear National Lakeshore. Kurt took several hours cleaning and inspecting the lens, which was in good shape, needing only one small repair. 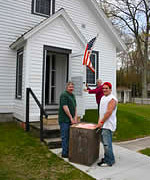 May 27, 2011. . . a ribbon cutting and dedication took place in Mission Point Lighthouse. The 5th Order Fresnel Lens now sits inside Mission Point Lighthouse, making the Lighthouse complete once again. The lens has been dedicated to all of Mission Point’s Keepers and to the community of Old Mission Peninsula.